Saving Destiny is the first novel I’ve written that has no suspenseful mystery at the heart of the story, but that doesn’t mean you won’t be surprised along the way. Enjoy! Sloan Ridgeway and Mac Watson’s fairy tale ended in tragically-ever-after. For years, they’ve been separated by the grief and guilt surrounding his little sister’s death. Devastated, Sloan traded small-town Kentucky for star studded big cities and tabloid fame, but life in the limelight was filled with emptiness and betrayal. 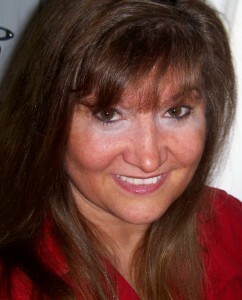 When one more highly publicized, broken engagement sends Sloan home to lick her wounds, she comes face-to-face with Mac. He obviously hasn’t forgotten the past, but despite his antagonism, he’s more compelling than ever. To save herself the heartbreak, Sloan vows to keep out of his way, but destiny won’t let her. 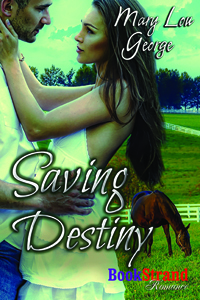 Desperate to rescue an abused horse in foal, Sloan is forced to enlist Mac’s help. Working together day after day begins to reignite the passion they once felt for each other. But is passion enough? Can Sloan and Mac breathe new life into their malnourished hearts and prove that true love trumps tragedy every time? “People around here are finally rising to the challenge. I’m having a tough time making decisions,” Sloan said to Stick one morning while she carefully measured out Destiny’s breakfast. “Don’t look at me,” he said. “You’re being ridiculous,” she said. Was he trying to provoke her? She’d show him. “On second thought, as godfather, you’re the one who should help me.” She stabbed Mac’s chest with her finger. “Oh yeah? Well that’s just not gonna happen.” He smiled in that irresistible way again and folded his arms across his chest. Twenty minutes later, Mac and Sloan were sitting in the office of the only caterer within a hundred miles, waiting for the owner to finish with a customer. “What’s wrong with balloons? Everybody likes balloons,” Mac said. “No. Not really.” Gratified to have squashed the hope in his face, she smiled without conscience at the caterer as he took his place behind the desk. Mac looked enormous and uncomfortable sitting in the fussy surroundings. Sloan got a small thrill watching him shift in his chair. Designed to fit regular-size people, it could barely hold he-man Mac. Laughter burst from Sloan’s belly like a Kentucky Derby racehorse out of the starting gate. Mac was lost in a fit all his own. Lacking the requisite sense of humor, the caterer frowned and waited patiently for them to calm down and resume the meeting. She sent him a pitying look. Lunch felt like old times. Shocked to see them together, fellow diners sent them curious glances. The gossips had something new to talk about, but in front of Mac and Sloan, they said nothing. The food was as greasy and good as Sloan remembered and their conversation was easy. By some silent agreement they set aside past sorrows for the moment and spent the time getting to know each other again. He talked about his work and how much he enjoyed restoring old houses and making them beautiful again. Sloan opened up enough to tell him how involved she’d become in the charitable foundation her paternal grandfather had started. I hope you enjoyed Mary Lou George’s visit as much as I did today. I’ve added Saving Destiny to my TBR list and I’m sure I’ll be going back for her other books too. Thank you so much for visiting with us today, Mary Lou George, and I hope you’ll come back again when your next book releases or just to say hi!